Here’s another native mint from the Lamiaceae family. Like all the mints, this plant has 4-angled or square stems , opposite, elliptical leaves, and a pronounced mint fragrance. Hoary mountain mint has white leaves at the top of the plant where the flowers arise. The white to purple flowers are 2-lipped, with the lower lip having 3 lobes. The tiny, speckled flowers are packed in dense terminal clusters. This arrangement of dense flower heads surrounded by white leaves gives the flower a showy appearance. Mountain mint is a dependable nectar source for bees, wasps, and butterflies. The plants grow 1-2 meters tall, flowering June through October. It spreads by rhizomes and is typically found growing in rocky soils. 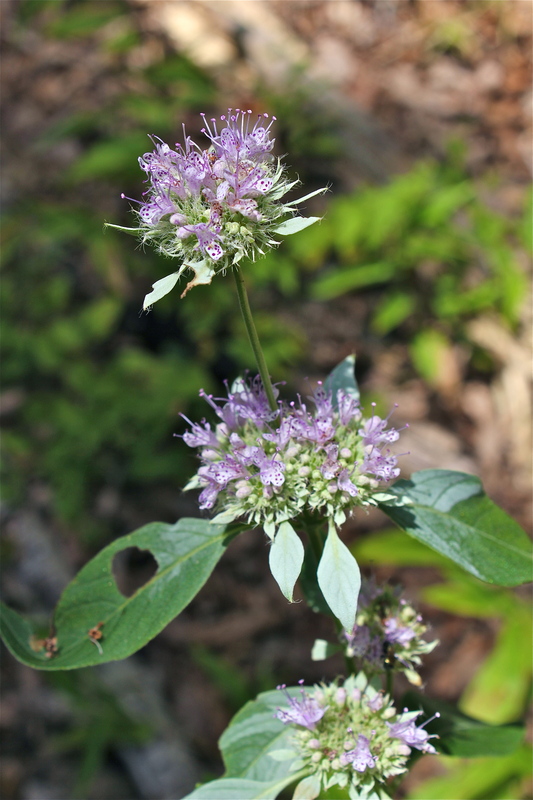 Look for mountain mint in forest openings, along roads, and in fields. True to its name, I spotted this group of mountain mint plants growing in a forest clearing in the foothills outside of Blacksburg, VA; another population was growing alongside the road next to Big Stoney Creek in Giles County. Mountain mint is listed as an endangered species in some New England states. Found some of these on Pilot Rock, in Pisgah National Forest yesterday. Super fragrant– very pungent taste. Picked some leaves for making tea at home. Thanks for helping me identify this plant! Nice! I hope you enjoy the tea!